Last weekend my wife and I went out to dinner with a friend from college to Bollywood Bistro, a fun Indian establishment in old-town Fairfax, Virginia. The service was enthusiastic (if a bit overbearing with the water-glass refills). 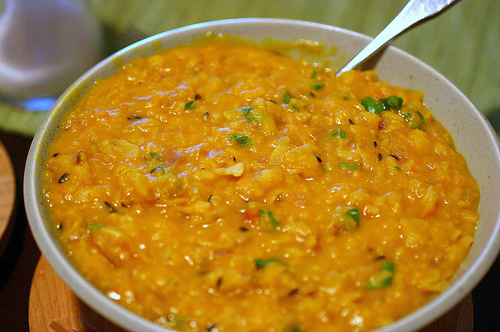 And one of my favorite dishes was the yellow dal, which is a very common dish in Indian cuisine. I was inspired to try it myself the next evening at home, and it was quite satisfying. I started with a popular recipe from Ruta Kahate’s book 5 Spices, 50 Dishes: Simple Indian Recipes Using Five Common Spices, and adjusted it to my available ingredients and cooking preferences. I came up with the recipe below. A note for those who appreciate the health benefits of herbs: Indian cuisine is filled with turmeric, which has potent anti-inflammatory effects when used in generous quantities. It has also been shown to have some anti-cancer effect, and researchers are also investigating its possible effectiveness in Alzheimer’s disease. To maximize its bio-availability, it needs to be combined with black pepper, which works synergistically with turmeric’s most active constituent, curcumin. Hence, I’ve added black pepper to this recipe. Enjoy this tasty opportunity to contribute to science! 3. While lentils are cooking, heat ghee or oil in a skillet over medium to high heat. Do not allow the oil to smoke. (Ruta Kahate’s instructions tell you to heat the oil to the smoking point, as do many Indian cooks. But this renders the oil toxic.) Sauté the onion until soft and golden. Add cumin and sauté until fragrant. Then add the garlic and sauté for just a few minutes, keeping an eye on the temperature so that the ingredients don’t scorch. 4. Add the coriander, turmeric and cayenne, and stir the mixture into the dal. Add the cilantro, stir again, and serve hot with rice and/or Indian flatbread. This entry was posted in Salads and Sides, Vegan, Vegetarian and tagged Beans, Indian by Baron. Bookmark the permalink.